A pallet flow rack is designed to help warehouses maximize their space, inventory, and efficiency. These gravity fed systems allow warehouse professionals to add pallets in the rear of the system, which then cycle through to the front, in a first-in-first-out (FIFO) manner. If your company quickly moves a great deal of inventory, these systems offer an efficient solution. A great benefit of using a pallet flow rack system is that they are completely customizable. Depending on your inventory expectations, we can design a system that seamlessly meets your pallet dimension needs. Along with flow lanes that are engineered for the right downward pitch so you can move products from back to front, the system also includes braking to keep pallet speed consistent. Is a Pallet Flow Rack Right for You? 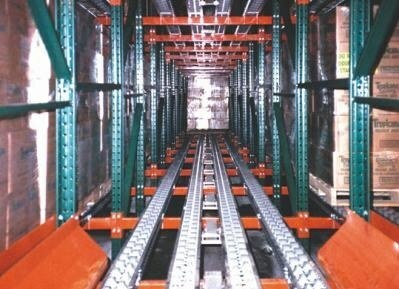 Anyone who quickly moves inventory can benefit from a pallet flow rack system. In particular, those who have inventory with a short shelf life will benefit from the easy-to-manage system that prevents products from going bad at the warehouse. Q. 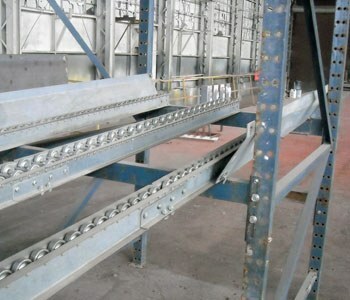 What is pallet flow racking? A. High density gravity pallet flow is a first in, first out (FIFO) system. It is configured for the pallets to be loaded from the rear position, then flow to the front position for picking. 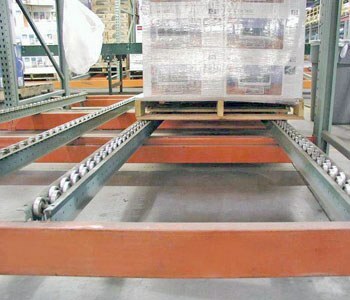 Pallet flow racking is like having a conveyor system built into your pallet rack. It allows for a great throughput of pallets. Q. What are the benefits of gravity pallet flow rack? A. 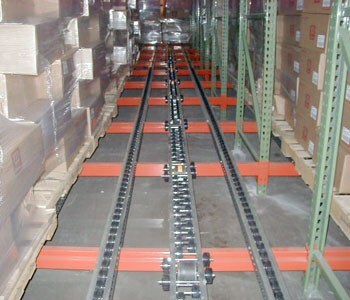 The most popular benefit of pallet flow rack is the first in, first out configuration. It allows for greater throughput of pallets and can minimize inventory from being dated or spoiling. Q. What applications best fit pallet flow rack? A. This type of system is very popular in the food industry to help minimize spoilage because of the first in, first out flow. 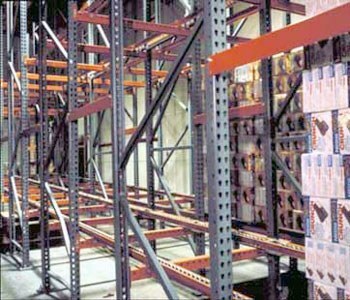 Pallet flow racking is also widely used in high volume distribution centers, staging areas, and pick modules. Q. 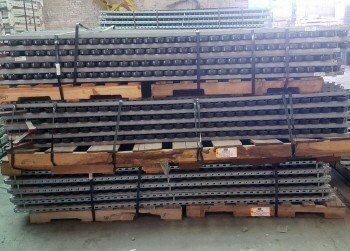 Is used pallet flow rack available? A. Yes, we can provide used material in many cases depending on your exact needs, which can help save you time and money. We also have a full in house fabrication and paint shop to customize your order or we can provide new material direct from the factory.